Odds are that the man who took home last year’s cinematography Oscar for Inarritu’s best-picture winner “Birdman,” and a year earlier for Alfonso Cuaron’s “Gravity,” will soon enough be a contender again, considering he’s one of the most acclaimed cinematographers working today. Since launching his feature career in the 1990s, Lubezki has collaborated with a who’s who of directors, from Tim Burton to Terrence Malick to Cuaron, who he met when both were film students at the National Autonomous University of Mexico. The beauty and style of Lubezki’s work, featuring long, unbroken takes in “Birdman” or the exclusive use of natural light in “Revenant,” has made him perhaps the first superstar cinematographer. Audiences chant his name at Q&As, and he has been stopped on the street by autograph-seekers. He was even courted by the beer company Indio to star in a commercial that aired on Mexican television during the Academy Awards — almost unheard of for a behind-the-camera artist. 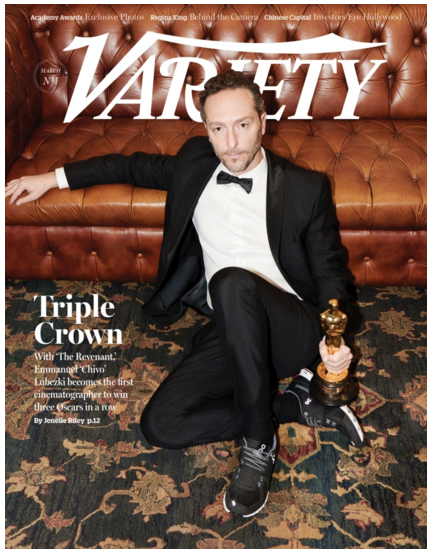 Lubezki, who has earned eight Academy Award nominations, resides with his wife, Lauren Strogoff, and their two teenage daughters in Los Angeles. By his own admission, he likes to keep a low profile and has always been press shy — and hates to have his photo taken. “He has three Oscars, and he must be the most miserable man on Earth right now with all the attention,” quips Cuaron. It’s true that Lubezki has qualms about being in the spotlight. When he was contacted about the Indio commercial, his response was one of disbelief. “It’s so external and foreign to what I really like to do,” he says. “I don’t like to be in front of the camera, and I never thought anybody would call me or I would accept an offer like that.” He was ultimately convinced after talking to the creatives at the ad agency, who put together a lyrical 60-second piece showing him working behind the camera. As for the repeat Oscar wins, he is thrilled but a little uncomfortable. Though he has yet to watch his speech from this most recent Oscar night — he says he’ll need a couple days — he has viewed the previous two, and says it’s like seeing another person. I’m so proud of my cousin, Emmanuel Lubezki, for his BAFTA for Bird Man. Michael Keaton was right — he is a genius and a ‘mentsch’!